Are there telltale signs of climate change? Before jumping into noteworthy aspects of Hurricane Harvey, an analogy I heard from NPR science reporter Christopher Joyce comes to mind. The analogy gets to the “fat tail” aspect of extreme events. A scorching heat wave or torrential rain are more likely now than before after the average background conditions shift a little (see Fig 1-08). Scientists know that warmer air holds more moisture. That moisture can be taken up by storms resulting in extreme rainfall events. We saw evidence of this in the increase in volume of water dumped during the most intense downpours of a year in the Continental US. This heavy precipitation can be further fueled as climate change warms oceans. Hurricane models that compare the past three decades with further climate change (RCP 4.5) toward the end of the century show an increase of average hurricane intensity, precipitation rates and the number and occurrence of days with intense category 4 and 5 storms. How does it work? If a tropical depression forms, and conditions prove favorable to grow into a Hurricane, warmer seas can increase the power of a storm primarily through evaporation of the hot seawater and other processes. When conditions get too hot in the tropics, the ocean tends to shed that excess heat away from the tropical surface ocean as fast as possible. It is as if the tropical ocean ‘sweats’ in the summer and tropical depressions, storms or hurricanes, are dramatic ways to transfer that excess heat away from the tropics. We saw a similar scenario with Hurricane Harvey, which quickly gained intensity—moving from a tropical depression to a category 4 hurricane —as it passed over the unusually warm Gulf waters in the days before it made landfall. Local sea level can influence flooding in several ways. Tropical storms and hurricanes can blow so hard that they literally pile water up onto the shore. Storm surges today are more hazardous in low-lying coastal regions compared to the same storm surge a century ago. Due in large part to climate change, seas are on average 8 inches higher since 1880. Galveston, Texas experienced around a foot of sea level rise in just the last 50 years due to the combination of climate change and sinking coastal land from groundwater pumping, oil and gas extraction and natural causes. In addition to storm surge, intense hurricane precipitation can swell the rivers that are draining into higher seas during a storm, which can back up and cause a dangerous situation as rivers and reservoirs overtop their banks and flood adjoining land, something we observed during Hurricane Harvey. Hurricane Harvey shattered the storm total rainfall record for the continental U.S. at over 51 inches at a rain station near Cedar Bayou Texas. While the Gulf of Mexico normally has hot seas in August, they were unusually warm when the storm hit. 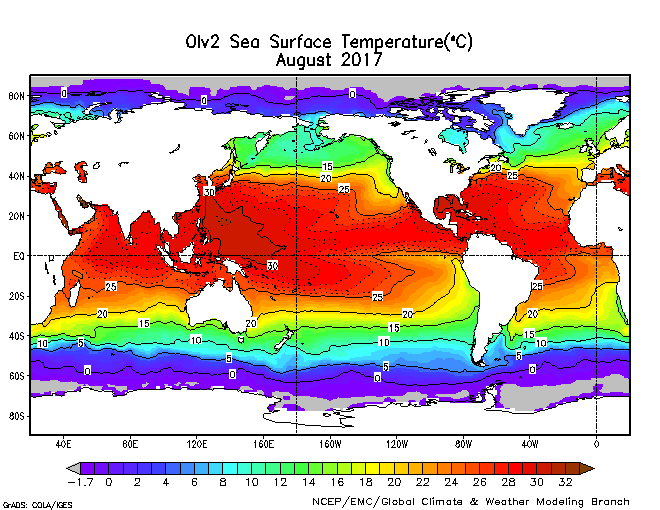 The average sea surface temperature over August 1-23, 2017 in the majority of the Gulf of Mexico was greater that 30 degrees Celsius (86 degrees Fahrenheit). Not too surprising since the Gulf of Mexico sea surface temperatures were breaking records the prior winter. This allowed Hurricane Harvey to jump from a tropical storm to a category 4 Hurricane while passing over the Gulf, which had sea surface temperatures 1.5 to 4 degrees Celsius above normal. Designed for storms in the 1940s, two of Houston’s reservoirs are overflowing and at least one levee breached under the tremendous pressure from flooding that resulted from the trillions of gallons of precipitation dumped by Hurricane Harvey. Additionally, the storm surge in Galveston Bay slowed the drainage rate and much of the spongey soils underneath the acres of impervious surfaces were unable to help, making it a stranded natural asset in this storm. Data are being collected for investigators to tease apart the relative contributions of various factors likely to have influenced Hurricane Harvey. Typically, extreme weather scientists investigate the weather and climate change factors for hazards. If better data are available on the infrastructure, land use decisions, historic inequities, etc. that influence exposure and vulnerability to a weather hazard, these can be incorporated into more comprehensive investigations of impacts risk (see AR5 WG2 figSMP-1). As we move into recovery and rebuilding, it will be important to understand all the major factors so Houston can rebuild in a way that better protects lives and property.